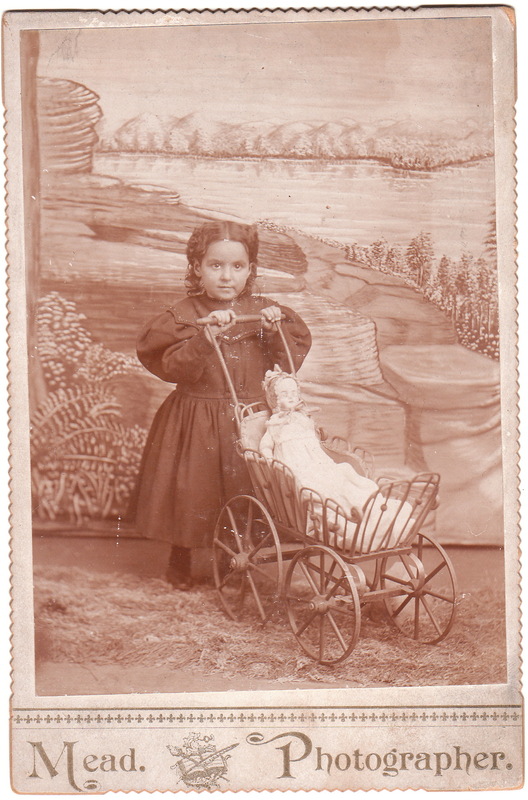 The little girl featured in this cabinet card is absolutely adorable in her pose pushing her doll in a baby carriage. The backdrop in this photograph is absolutely not adorable. The screen is so amateurish that it looks like it was painted by a group of the subject’s classmates. The photographer of this image has the last name of Mead. Unfortunately, the location of his studio is unknown. It is an unusual occurrence that the name of the photographer is listed on the cabinet card without an address of the studio. After all, photographers used cabinet cards as free advertising by listing their location and special talents. The reverse of the cabinet card has an inscription that indicates that the subject of this portrait is named “Mamie Cole (Griffis)”. There were many Mamie Coles, Mamie Griffiths, and photographers named Mead living in the United States during the cabinet card era. It is impossible, with available information, to truly identify both subject and photographer. It is interesting to note that there was a photographer in the Dakota Territories name Josiah J. Mead and a woman named Mamie Cole who was born in South Dakota in 1894. Fun photo! I’ve been wondering in general where photographers in those days got their backdrops. Did photography supply companies offer them for sale, or were individual photographers responsible for creating / commissioning their own? Surely not every photographer was also a skilled scenic painter, and yet so many backdrops look quite amazing. Except this one, of course. I suppose it’s probably too generous to speculate that the painter was going for some sort of artistic, non-photorealistic style. I also wonder what it looked like in color. I have read some turn of the century photography journals and seen advertisements for backdrops from photography supply companies. I saw a picture of the equipment and remember it holds many different backdrops hanging similar to the way a shade hangs down over a window. Depending on the photographers interest and budget, he could buy equipment that held small or large numbers of backdrops.The backdrops that I have seen in cabinet cards vary from amateurish to truly artistic.It really required talent for photographers to do a competent job of coordinating backdrops, props and subjects. Thanks for your reply. I suspected backdrops could be purchased, it’s just not a topic I’d seen discussed before. I’ll have to look for some of the ads you mentioned. Those could be fun to read.